MOSCOW - The Philippine government is studying the procurement from Russia of a helicopter, trainer planes and submarine for the military, Defense Secretary Delfin Lorenzana said. A technical working group from the Philippine Air Force will go to Moscow to study the plan and make a recommendation, Lorenzana told ABS-CBN News on Tuesday at the sidelines of a military forum here. The Philippines is also considering South Korea and the US to supply the submarine and helicopters, respectively, said Lorenzana. "We are going around at tingnan natin ang equipment nila kong angkop ba sa atin ang paggamit at affordable ba ito," he said. Last year, Russia donated 5,000 Kalashnikov rifles and trucks to the Philipines. Around 100 of the donated rifles went to the military while the rest was distributed to the police. State troops used some of the weapons against pro-Islamic State extremists who laid siege to Marawi last year, said Lorenzana. Manila is also studying the purchase of P400 million worth of grenade launchers from Russian state-owned firm Rosoboronexport, a senior Philippine general familiar with the deal earlier said. 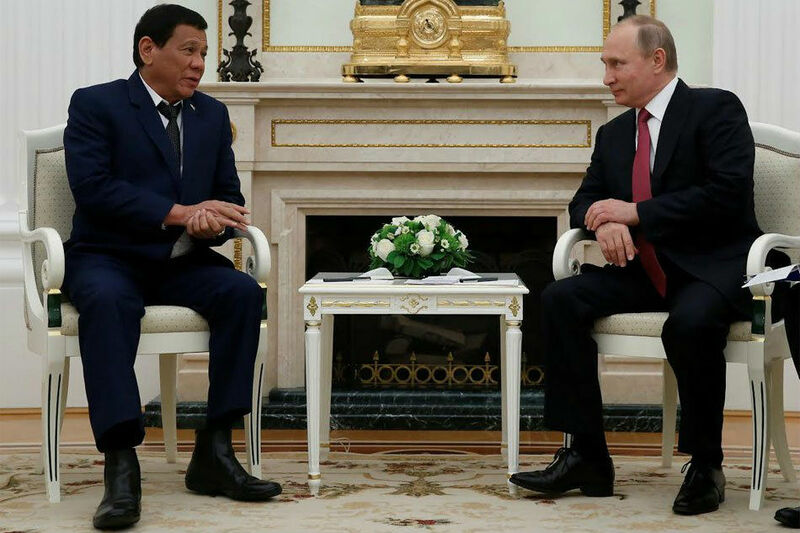 If the deal pushes through however, the Philippines may face sanctions imposed by the US against any country trading with Russia's defense and intelligence sectors. Approved by US President Donald Trump last year, the sanctions are designed to punish Russia for its 2014 annexation of Crimea from Ukraine, its support for Syria's government and alleged meddling in the 2016 US presidential election. Presidential Spokesperson Harry Roque said that while the administration will still study the matter, he believes the planned purchase of grenade launchers is a sovereign decision of the Philippines. “In the exercise of a function of national defense, we have absolute immunity as a sovereign state. I don’t know how a US law could be applicable to a transaction that will be done outside the US,” Roque said in a press briefing last month.